Is this an anti-Muslim rule … or not? Donald J. Trump swears up and down, left and right — puts his hand on a stack of Bibles and says “Scout’s honor” for all I know — that his ban against refugees is not an “anti-Muslim” initiative. The president, though, has delivered to our enemies a prime-time, gold-and-silver-plated recruitment tool. He calls our enemies “radical Islamic terrorists.” Yes, they are. They also are experts at distorting people’s intentions, even their very words, twisting them into propaganda fodder. What the president has done is create a climate for terrorists such as the Islamic State and al-Qaeda to target American Muslims to join their fight against the “infidels.” He also has delivered to a much wider audience the very message that his two immediate predecessors — Republican George W. Bush and Democrat Barack H. Obama — fought like hell to avoid delivering. Presidents Bush and Obama said clearly: We are not at war with Islam! The enemies are the monstrous murderers who have perverted a great religion. Now we have the potential for the precise opposite message being delivered to those who might be inclined to join a radical militant movement, to take up arms and to join the fight against the rest of the civilized world. The president of the United States is expected to speak with absolute clarity and precision. When we’re dealing with the complexities of the current world geopolitical climate, any misstep or clumsy language can produce dire consequences. The president’s refugee ban has roiled members of the president’s own party, created a firestorm within the legal community over its very constitutionality, and it has possibly enraged Muslims around the world — and in the United States — to the point of causing grievous harm. POTUS fired his own acting AG? There’s been some interesting reporting overnight about the political earthquake that the president of the United States created. Donald Trump fired acting U.S. attorney general Sally Yates because of her refusal to defend the president’s order banning refugees entering the United States temporarily from certain countries … where Muslims comprise the majority of the population. 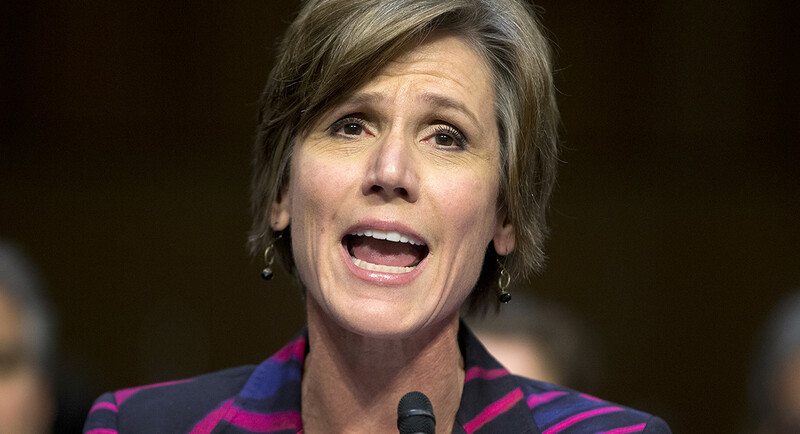 Yates is held over from the Obama administration. Here’s the weird part: Trump and his team reportedly asked Yates to stay on the job until the president could have his own AG confirmed by the U.S. Senate. The president selected her to be the acting attorney general. 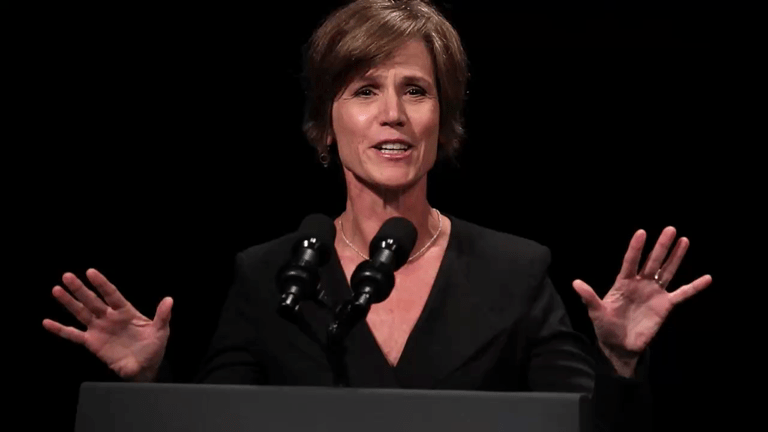 Yates is known to be a dedicated career federal prosecutor who has worked in the Justice Department under both Republican and Democratic presidents. She said she believed the president’s order was unlawful — under her understanding of federal statutes and the U.S. Constitution. I believe it is the duty of the AG — acting or otherwise — to follow the law and not necessarily to do what he or she is told to do by the president. Trump chose Yates, who then followed the law. Then the president accused her of “betraying” the Justice Department. Hit the road, he told her. And now we have our first potential constitutional crisis. Just think: It’s Day 11 of the Trump administration. I had not heard of Sally Yates until today. Now she becomes something of political hero in the eyes of millions of Americans — thanks to Donald J. Trump’s decision tonight to fire her from her job as acting U.S. attorney general. What did the former assistant AG do? She declined to argue on behalf of the president’s decision to ban refugees trying to enter this country from seven Muslim-majority nations. Yates questioned whether the executive order was lawful. Oh, yes — she is a holdover from the Obama administration’s Department of Justice. My head continues to spin. My eyes are bugging out. My heart is palpitating. Ten days into his presidency and Donald Trump’s penchant for pandemonium has claimed its first victim. Yates was holding down the DOJ post until Jeff Sessions was to be approved by the U.S. Senate. I’m not yet sure about the legality of the executive order. Perhaps the former assistant AG is right; perhaps she is wrong. Whatever the case, the president chose to fire her summarily without first trying to persuade her that she really ought to do the job she was supposed to do. Some folks around Washington are bringing up some dark memories. Can you recall the Saturday Night Massacre, when President Nixon sought to remove a special prosecutor who was examining the Watergate caper? Do you recall he then fired — in succession — the attorney general and his assistant AG who refused to dismiss the independent counsel? The task then fell to the U.S. solicitor general, a fellow named Robert Bork, who went on to earn his own place in our nation’s history. Honeymoon for this president? It is officially over. Steve Bannon … national security expert? C’mon! I’m still trying to catch my breath over the news of how Donald J. Trump has revamped his — I mean our — National Security Council. He has rolled back the emphasis of two key players: the chairman of the Joint Chiefs of Staff and the director of national intelligence. These two individuals no longer will take part in what is called the “principals committee,” the panel that meets regularly with the president to assess national security threats and to deliver critical advice on how to handle those threats. Who, though, is going to sit in? Steve Bannon, the former head of Breitbart.com — the right-wing website that has for some time spewed white nationalist rhetoric. Steve “Bleeping” Bannon! This guy has taken a job as senior adviser to the president. He became the chairman of the campaign that resulted in Trump’s election. His national security chops? His expertise on how to fight the Islamic State, al-Qaeda, Boko Haram? What knowledge does this guy bring to developing a strategy to rein in Kim Jong Un, or the ayatollahs who run Iran? As near as I can tell, Bannon is unqualified to sit on the principals committee. He is no more suited to have access to the nation’s top security secrets than, oh, I am. I keep wondering whether Bannon is going to advise the president in purely political terms about national security strategy. Aren’t these issues above and beyond partisan political concerns? One aspect of protests deserves a mention here. It’s the element of disruption they cause to those of us who happen to get caught in the middle of them. 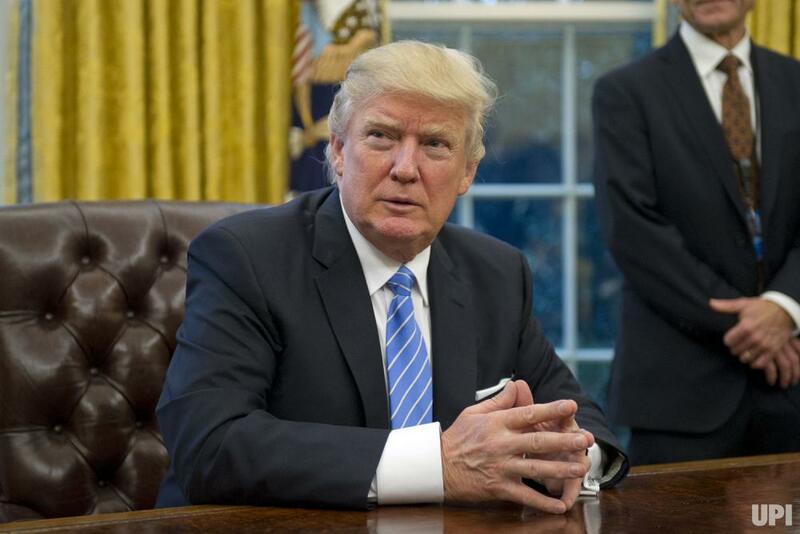 Donald J. Trump’s executive order banning refugees from certain Muslim-majority countries has prompted protests at airports and other transportation terminals around the nation. I have just returned home from a five-day trip to the Pacific Northwest to wish my beloved uncle a happy 90th birthday. 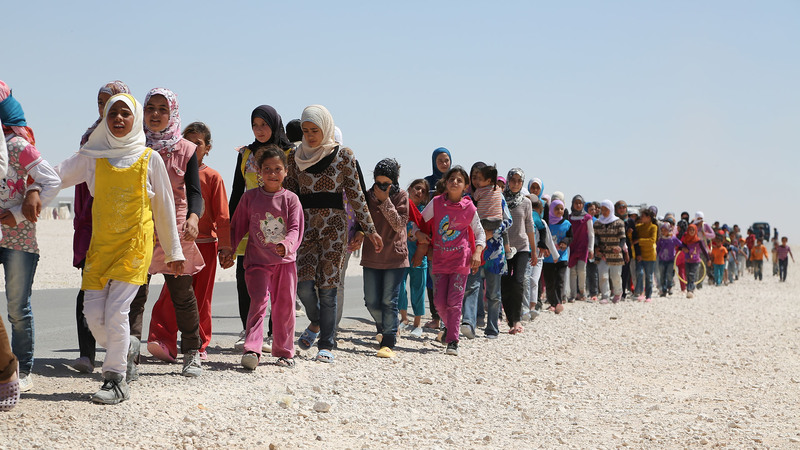 While I was there the president issued that ridiculous, paranoid order banning refugees. What happened, then, at Portland International Airport? Protesters clogged the place. They carried signs. They yelled at security officials. They made nuisances of themselves! Other protests broke out all across the country. People marched in the streets. When I left PDX this morning en route to Dallas/Fort Worth International Airport, I didn’t encounter any protesters at my point of departure. I thought there might be a horde of ’em at DFW. There weren’t. Good deal. I got to my next connection to Amarillo and arrived quietly at the terminal. My point, though, is that protests are fine. We are a country founded by protesters, people who didn’t like taking orders from monarchs. Those good folks then set about to build a government in The New World that guarantees people the right to assemble peaceably to “see redress of grievances” from the government. It didn’t necessarily suggest they could disrupt the flow of life’s activities for the rest of us who choose to keep our protesting to ourselves. Just so you know, I detest what the president has done. It’s in-American. For all I know it might even be unconstitutional. I’ll let the legal scholars of the world decide that one. 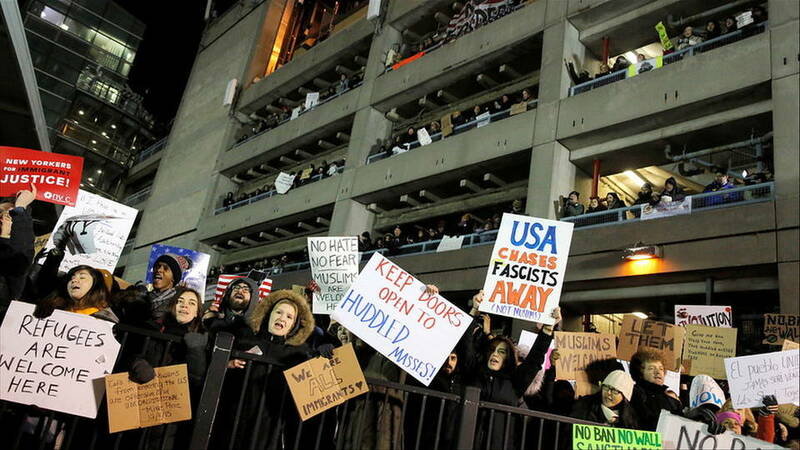 As for marching at airports, train stations and ship terminals … well, I’ll leave that for others. Just stay out of my way. Please. 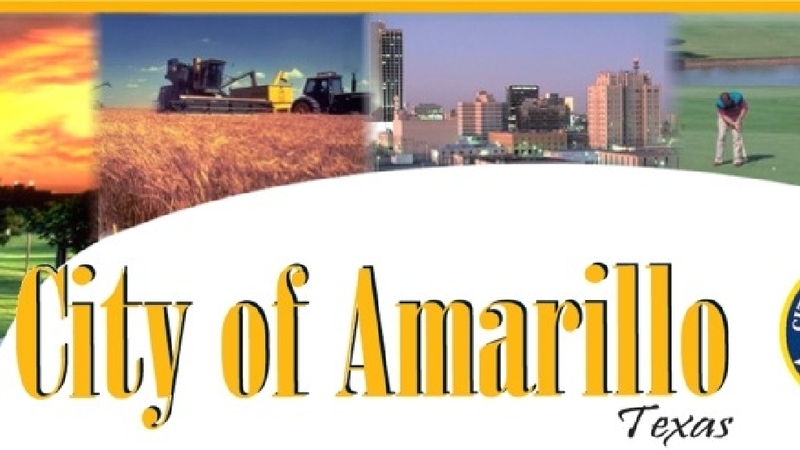 ‘Amarillo Matters’ … to whom and for what purpose? A new political action committee has popped up on Amarillo’s landscape. I took a quick look at its website. I found a tab at the top labeled “About Us.” You see these things on websites all the time. The tab implies some information about the PAC, its sponsors, its intent, perhaps a statement or two about how it hopes to achieve whatever noble end it seeks. OK, I’ve read the mission statement a couple of times. It’s noble, high-minded and — I’ll presume for a moment — well-intended. What I cannot gather, though, is its source. Who are the folks backing it, supporting it presumably with money or who this group intends to benefit? It says it intends to elect leaders with “impeccable character” and who are “focused on the needs and well-being of the citizens of Amarillo.” Well, duh? Who isn’t — in their own heart and mind — focused on those things? I, too, want the best for our city. My wife and I pay our taxes, we enjoy the perks the city has to offer, we enjoy some of the quality of life accoutrements available to us? We want more of it. Amarillo Matters? Who are you? PORTLAND, Ore. — We went to church this morning. We listened to the liturgy. We heard lots of chanting, prayers, a short Scripture lesson from the priest. Then we had a short reception in another room, part of which was to honor my uncle, a longtime church member who turned 90 this weekend. But while we were meeting and greeting some lovely folks who came up to wish my uncle a happy birthday, I met two women; they are sisters. Their names were Cathy and Kiki. One of them is in her mid-90s; the other is a bit younger and I won’t venture a guess. They told me their father worked in the same bakery as my grandfather, my Papou George — who was the father of my uncle and my late mother. “Excellent!” I said. Then I told them about how close Katy and I have remained over many years. 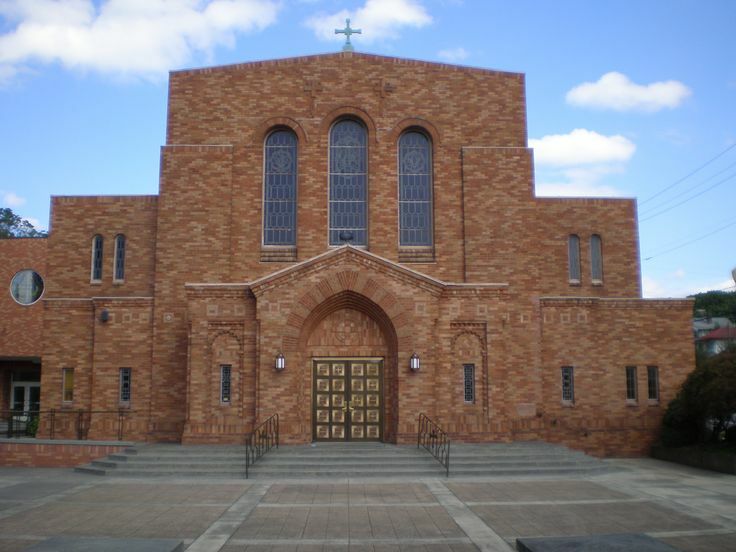 You see, in the Greek Orthodox tradition, the godparent becomes a sort of surrogate parent, or perhaps a supplemental parent. Tradition holds that if something were to happen to one’s biological parents, the godparent would step in to take over rearing you. Katy never had to fill that role. But she remains a part of our family. My wife adores Katy and her husband, Christ … and they adore her, too. So I told Cathy and Kiki about my understanding of the godparent/godchild relationship within the church. “So … that means we — you and I — are family!” I exclaimed. This trip back to the city of my birth, thus, has revealed a family connection I didn’t know I had. Let’s ponder this for a moment. This United States of America used to be seen around the world as the place where everyone wanted to go. To visit. Or … to live. It didn’t matter from where you came. You saw the U.S. of A. as the international beacon of hope. We have that statue in New York harbor that welcomes the poor and dispossessed. That’s all changed, according to the current president of the United States. Donald J. Trump says if you come from certain countries and perhaps adhere to a certain religion, you are no longer welcome. The welcome mat has been rolled up, the door has been slammed shut and we won’t answer the bell when you ring it. International terrorists? They’re to blame? No. We’ve had them in our midst for decades, if not centuries. Terrorists reside here at home, too. The president and his team say they want to protect us from those who would do us harm. Really? What about the crazed corn-fed American-born morons who open fire in movie theaters, or at night clubs, or — for God’s sake! — in elementary schools! Or, say, the anti-government sociopath who blew up that federal courthouse in Oklahoma City. The Trump administration has pushed the panic button. 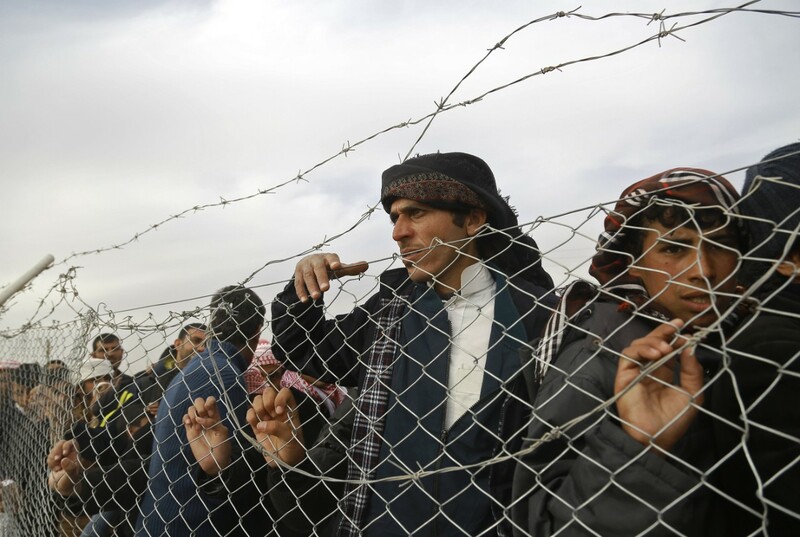 It has elevated the fear factor to new levels by excluding refugees from several Muslim-majority nations. But the president insists he isn’t invoking an anti-Muslim policy. Well, Mr. President, it doesn’t look that way to me. What’s next? Will he now send crews into the NYC harbor to remove that inscription on the statue? The president must actually believe what he said while campaigning for the office way back when. How else does one explain his decision to scale back the role of the chairman of the Joint Chiefs of Staff — his top military officer — while elevating the role of senior policy adviser Steve Bannon on the National Security Council? This is yet another mind-boggling, head-scratching move from the president as he settles into the only public service job he’s ever sought, let alone occupied. The NSC is the panel of experts on which the president relies to give him all the details on national security threats. The Islamic State, along with the myriad other foes around the world, comprise a potential and potent threat to our security. What’s more, the director of national intelligence also has seen his role diminished under the Trump administration’s new way of doing things. 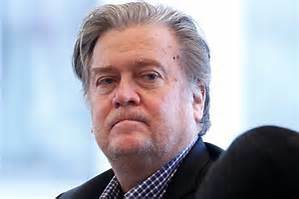 You might be wondering — as I have been wondering — what kind of unique expertise does Bannon bring to the discussion? Well, he served in the Navy once. That must count for something. He earned his political spurs, though, while running the right-wing website Breitbart.com — the organization that has spewed some white nationalist rhetoric. Sen. John McCain calls the Joint Chiefs chairman the individual who is supposedly “indispensable” to the president on these national security issues. Yes, one would think. Not the president. Time to wonder about Trump’s mental state? I am not going to diagnose Donald J. Trump’s mental capabilities here. I am going wonder out loud, though, as to whether he needs counseling, or some related professional help. The president hasn’t yet produced a single shred of evidence to back up the claim. He has continued to insist through innuendo that “in my opinion” such illegal activity occurred … and that all those millions of illegal voters cast their ballots for Hillary Rodham Clinton. Now he has declared that a Texan is the source of the allegation. My head is going to explode at any moment now. Trump’s assertions is an assault on the democratic process. 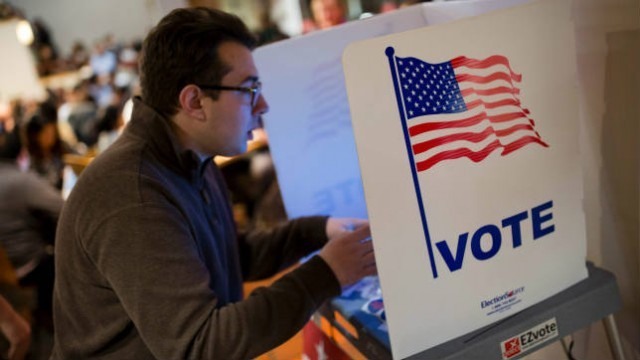 It insults the hard work being done by across the nation — by state elections officials — to ensure “free and fair elections.” It is an assault on their integrity, on their good faith and on their professional competence. In Texas, these officials are elected by voters who live in the counties. They are county clerks who take an oath — just as the president, governors, county commissioners and district attorneys do — to “preserve, protect and defend” the Constitution and to obey all federal and state laws. When is the president going to get off this innuendo-driven effort to insist on something happening without ever providing a scintilla of evidence to buttress what he is alleging?